Unwanted green moss growth on your roof is an eyesore. Did you know it can also cause expensive damage to your roof over time? Continue reading to learn why moss is prone to growing on your home’s exterior surfaces and how you can remove stubborn moss with the easy-to-use Wet & Forget Outdoor cleaning products! What is moss, and where does it grow? Moss is a velvety, green plant that doesn’t have flowers, roots, or stems. It attaches to surfaces and absorbs water. Moss grows easily in humid areas that provide a moist environment for it to survive. Moss doesn’t require a ton of shade to grow, but shaded areas are ideal for growth. There are roughly 10,000 different species of moss worldwide. Will it harm the outside of my home? Moss can destroy your roof’s shingles and force them to lift away from the roof. Without the shingles in place, your home will be susceptible to water damage. A damaged roof, along with water damage, can lead to some pretty expensive repairs. 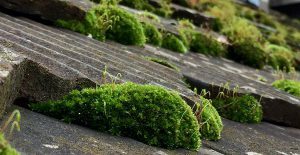 Moss retains moisture and holds it up against your roof, which can cause rotting. 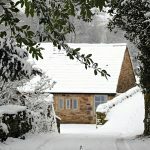 As the moisture trapped by the moss freezes and thaws, it can crack and pull apart your roof’s shingles. Moss also causes asphalt shingles to lose their protective granules. Moss has root-like structures called rhizoids that can burrow into your shingles and cause pitting. Besides your roof, moss can wreak havoc on other areas of your home as well. Moss can damage many deck surfaces and speed up the cracking and warping of wood decking. When moss grows on bricks, it speeds up the crumbling and deterioration. It can also damage porches, patios, and driveways by pitting the surface and growing inside any existing flaws, which speeds up cracking and crumbling. 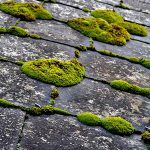 How can moss on my roof affect my homeowners insurance? Your homeowner’s insurance rates could increase if you have moss on your roof that is left untreated. Your insurance company can send out inspectors to take a look at the outside of your home at any time to observe if there are any changes. Moss can break down your roof’s integrity, leading to water leaks and significant water damage. Insurance companies don’t want to pay for expensive and unnecessary water damage claims. 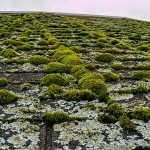 So, you don’t want an inspector to find that your roof is covered in moss because it can give them a reason to raise your rates or even cancel your coverage. Click here to read about a homeowner who was told by his insurance agency to remove the moss from his roof or face a policy cancellation. How can I remove moss? Many people try to remove moss by using cleaning methods that can do more harm than good. Power washing can cause serious damage to shingles, and the force of the water can even rip them off the roof. Bleach is a solution that many people have used in the past to try to remove moss. However using this old cleaning method has many faults. Bleach won’t be able to reach below the roof surface to kill the root-like rhizoids, so the moss can easily grow back. Bleach runoff will also potentially kill any surrounding plants around your house and accelerate corrosion on your roof, gutters, and downspouts. Wet & Forget Outdoor safely and easily eliminates moss. It completely removes the moss growth to the root-like rhizoids, so it’s likely that you won’t see any regrowth for about a year to a year and a half. In the Midwest, many of people don’t see rgrwoth for up to 3 years! Wet & Forget is gentle enough to use on a wide variety of outdoor surfaces, including any type of roof, decking, or siding. Wet & Forget works with the rain and wind to gently remove moss off your roof. No scrubbing, bleach, or pressure washing needed! The new Wet & Forget Rapid Application Hose End bottle makes it easy to apply to hard-to-reach areas and high elevations. 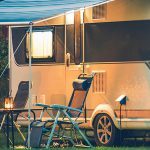 The jet tip nozzle allows you to reach surfaces up to 30′, so you don’t need to use a ladder to climb up onto your roof. 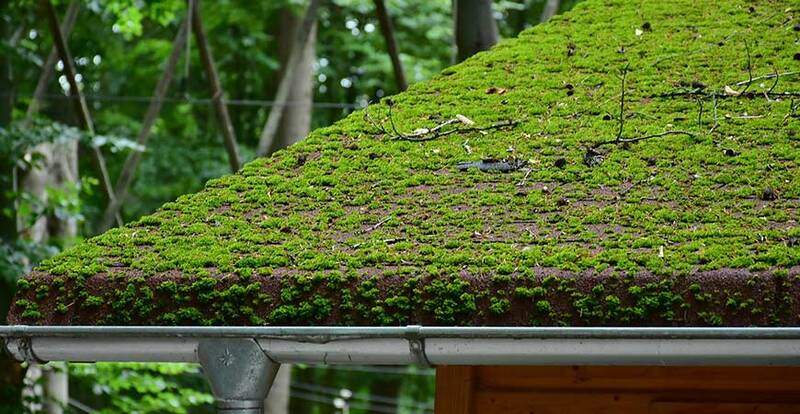 If you have moss growing on your roof, you can apply Wet & Forget with your feet firmly planted on the ground. Click here to check out one of our customer’s testimonials about how he used Wet & Forget to remove moss from his roof. How can I tell if moss is dying? Once applied, the Wet & Forget starts working immediately to remove the moss on your outdoor surfaces. Wet & Forget is designed to wash the dead growth off over time with exposure to the wind and rain. The Wet & Forget causes the root-like structures of the moss to lose their grip on the surface. You will be able to tell that the moss is dying off as the moss turns brown and curls up from the surface. After this, the dead growth will be washed away by the wind and rain over time. Click here to read more about moss and how to remove it from your outdoor surfaces with Wet & Forget Outdoor. For best results, apply Wet & Forget on a cool, overcast day to avoid evaporation of the product. Outdoor temperatures should be between 55°F and 80°F during the application and for the next 4 to 5 hours while the product dries. Also be sure to apply on a day where rain isn’t expected for the drying time period (4-5 hours). It’s best to spray moss on a day that’s not too sunny, to prevent the product from evaporating. Cooler temperatures ensure that the surface remains wet from your application, which gives the product optimum time to do its job. It’s important to allow Wet & Forget to have enough time to work on the surface to effectively remove the moss. We also recommend ensuring the surface is fully saturated by the Wet & Forget. 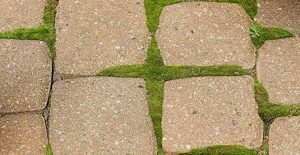 Moss is a very porous surface and can soak up a lot of material, so it is important that the area is saturated completely by Wet & Forget. The Wet & Forget solution needs to go through the moss to reach the roofs surface so the moss can fully detach from the roof. After the moss has disappeared, you can use Wet & Forget as maintenance to keep your outdoor surfaces clean and moss-free. Reapply the product on a yearly basis or at the first sign of new growth. Don’t waste any more time trying to get rid of moss. Wet & Forget does the hard work for you, so you can and get back to doing the things you love!